Jan 20, 2019 | What Am I Reading? 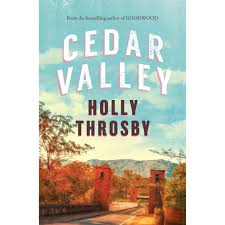 In Cedar Valley (Allen & Unwin Books 2018), author Holly Throsby depicts the minutiae of small-town life with pitch-perfect precision. The rural Australian archetypes (of people, of buildings, of community groups, of so many things) are familiar and relevant, and contribute much to this novel’s entertainment factor. Cedar Valley is a village brimming with secrets, lies, gossip and innuendo, and when a well-dressed stranger appears one day in 1993, sits himself outside the local antiques shop and waits there, unmoving, for hours, the rumours begin to fly. Cedar Valley reminded me a little of The Dressmaker by Rosalie Ham – so many of the townsfolk named and identified by their eccentricities, their unusual habits and their secret vices. At the very heart of the town lies an unexplained crime that at first seems unconnected to the locals. But as the narrative progresses, the links between this historical event and this small community become crucial to solving it. 21-year-old Benny Miller is another stranger who arrives in town on the same day as the man and moves into the green cottage belonging to Odette Fisher, an old friend of her mother. After leaving university, her boyfriend and her father, Benny is looking for answers about the mystery of her mother’s life and recent death. Odette takes Benny under her wing, and as the two women become acquainted, and grow to like and respect each other, the past is gradually uncovered. This novel is peopled with a wonderful cast of characters and is written with wit and humour and a keen observation of human nature. And the book rockets along at a cracking pace – even though the setting and characters are fairly quiet by nature (even the local police are almost comical in their pursuit of the truth), the plot nevertheless unfolds rapidly and with just the right amount of tension to keep our attention. This is one of those books that whisper ‘just one more page’ to you until you find you have consumed the entire book, all the time never knowing exactly what you will find at the end. I haven’t yet read Holly Throsby’s debut, Goodwood, but I’m keen now to do so, especially as I noticed a tangential mention of Goodwood in this book.